This piece explores the struggle that a person faces between their higher and lower desires. One face looks up towards the 99 beautiful attributes of Allah listed in the Qur'an; these are qualities that Muslims strive to embody in this life such as to be forgiving, loving, and so on. The second face looks down, suggesting one's self being drawn to baser desires. The snake, a common western symbol for "evil" is wrapped around the neck of the face looking down. 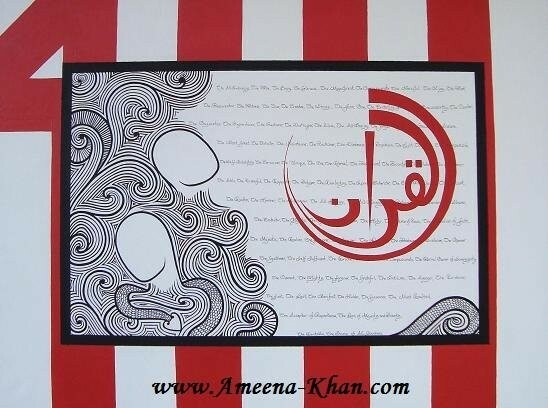 The background text is the Arabic word, "Allah."